A musical generation or two removed from Aimee Mann and Natalie Merchant, Vanessa Peters has one element neither artist can claim: a prolific streak. An independent artist with multiple releases credited to her name in the last decade, as well as those released with Ice Cream on Mondays, her former band composed of Italian musicians, Peters has built a sturdy international following of her own road-worn accord and crowdfunded albums. Returning after her last proper solo album, 2012’s The Burn The Truth The Lies, Peters’ latest, The Burden of Unshakeable Proof, finds the Dallas, Texas-based singer/songwriter taking an omniscient view of one emotionally crippled by the undoing of love. 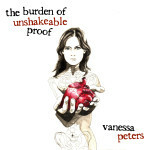 For its subject matter, The Burden of Unshakable Proof is a buoyant and lively collection of songs, a hug of knowing enlivened by the inviting voice of Peters. Future generations may refute Peters’ claim that “I am not a script you’re gonna study / I’m not a lesson to be learned” for The Burden of Unshakable Proof is a master class in probing matters of the heart. Stream/purchase The Burden of Unshakable Proof on vinyl, CD and digital formats below.